The world's largest airlines can be defined in several ways. American Airlines Group is the largest by its fleet size, revenue, profit, passengers carried and revenue passenger mile. Delta Air Lines is the largest by assets value and market capitalization. 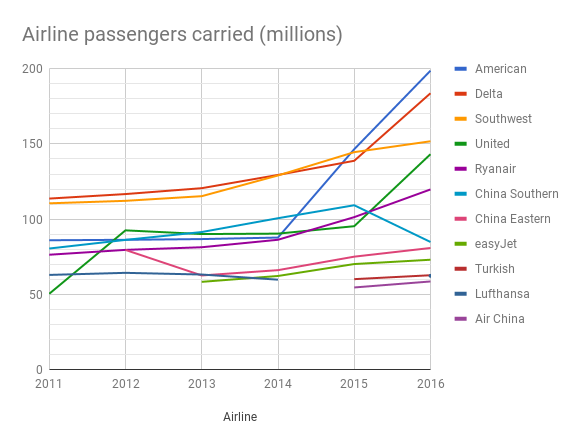 Lufthansa Group is the largest by number of employees, FedEx Express by freight tonne-kilometers, Turkish Airlines by number of countries served and UPS Airlines by number of destinations served (or United Airlines when excluding freight-only carriers). The IATA reports numbers for individual air operator's certificates and groups of multiple airlines can report larger numbers. Turkish Airlines is the largest airline by number of countries served. ^ "The World's Largest Public Companies". Forbes. 2018. ^ a b "World Airline Rankings". Flight Global. 2018. ^ "Global Air Traffic & Top Airlines 2016 (IATA)". IMM International. 28 June 2016. ^ "Scheduled Passengers Carried". World Air Transport Statistics 59th Edition. IATA. Archived from the original on June 18, 2015. ^ "Scheduled Passengers Carried". World Air Transport Statistics 58th Edition. IATA. Archived from the original on January 2, 2015. ^ "Scheduled Passengers Carried". World Air Transport Statistics 57th Edition. IATA. Archived from the original on November 13, 2013. ^ "Scheduled Passengers Carried". World Air Transport Statistics 56th Edition. IATA. Archived from the original on December 17, 2012. ^ a b "Summary of passenger and freight traffic" (PDF). World Air Transport Statistics. IATA. 2017. ^ a b "Summary of passenger and freight traffic" (PDF). World Air Transport Statistics. IATA. 2016. ^ "Scheduled Passenger - Kilometres Flown". World Air Transport Statistics 59th Edition. IATA. Archived from the original on July 6, 2015. ^ "Scheduled Passenger - Kilometres Flown". World Air Transport Statistics 58th Edition. IATA. Archived from the original on November 11, 2014. ^ "Scheduled Passenger - Kilometres Flown". World Air Transport Statistics 57th Edition. IATA. Archived from the original on October 29, 2013. ^ "Scheduled Passenger - Kilometres Flown". World Air Transport Statistics 56th Edition. IATA. Archived from the original on December 16, 2012. ^ "Scheduled Freight Tonne - Kilometres". World Air Transport Statistics 59th Edition. IATA. Archived from the original on July 4, 2015. ^ "Scheduled Freight Tonne - Kilometres". World Air Transport Statistics 58th Edition. IATA. Archived from the original on November 25, 2014. ^ "Scheduled Freight Tonne - Kilometres". World Air Transport Statistics 57th Edition. IATA. Archived from the original on September 21, 2013. ^ "Scheduled Freight Tonne - Kilometres". World Air Transport Statistics 56th Edition. IATA. Archived from the original on December 15, 2012. ^ a b "Top 10 World's Largest Airlines". AirportSpotting. 8 December 2017. Retrieved 26 March 2018. ^ a b "Ethiopian Airlines set to serve more country markets than MEB3 in S19, Ryanair still tops route table". Airline Network News and Analysis. 27 February 2019. ^ "American Airlines Tops The World's Most Valuable Airlines List in 2018". Airways International. April 26, 2018. This page was last edited on 18 April 2019, at 08:00 (UTC).